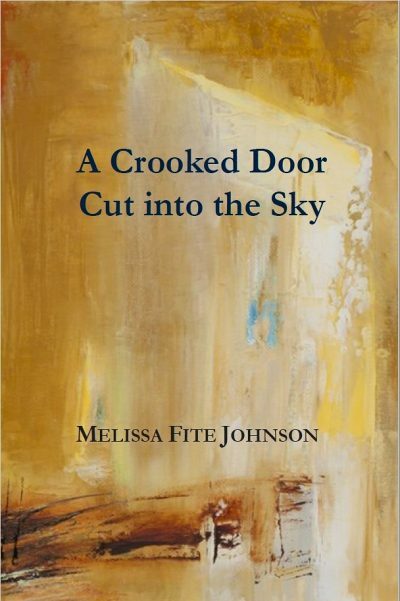 A Crooked Door Cut into the Sky by Melissa Fite Johnson is a poignant glimpse at the spaces between life and death and the ghosts that roam between. The chapbook begins with “Donating My Eggs,” set “in the fertility clinic waiting room.” We are privy to this liminal moment, the span of hope between what is and what could be. Throughout the chapbook, we return to this breadth, this neither/nor moment rendered as though it were composed of its own fleshy matter. We confront the space (endless, distant) of the decision not to bear children. The space after the loss of a father. out the window at nothing. However, the end of the chapbook offers the prospect of peace. In “My Book Club Discusses Still Alice,” the speaker declares “I know hope when I see it” after detailing a devastating memory of her ailing father. In the book’s final poem, the speaker is held by her now-gone father, “my head against his broad chest,” as if memory and poetry can comfort us and return us to a longed-for solace. As perhaps they can. Bsided: If this space of “what is between things” wrote a poem, what would it look like? I guess the subjects that haunt me the most are the effect my father’s disabilities and eventual death had on my life growing up, and the decision my husband and I have made not to have children. It’s a decision we’re both really content with, but even so, it was an idea to mourn—and it’s had an effect on our relationships with our mothers and with our friends, most of whom do have kids. I’m not sure I quite answered that question—hopefully, I came close. Bsided: What was your process for choosing the cover art for A Crooked Door Cut into the Sky, as well as the chapbook’s title? MFJ: In many ways, this chapbook began with Maura Cunningham’s painting, Another Portal. When it was the Switcheroo artwork years ago, I wrote “Visiting the Dead”—in which I imagine visiting my father in some sort of afterlife—as a response. Though my poem wasn’t selected, I was proud of it. Eventually, without even realizing it, I started building a collection around it. The title A Crooked Door Cut into the Sky is a line from that poem. I’d sent a version of this manuscript to Maggie Smith because she offers consultations and editing, and one of her many perfect suggestions was the collection’s title. Right away, that title struck me as right. Then I started to daydream—if I became lucky enough to publish this book, I wanted Maura’s painting for the cover. I guess the poems in this book are a bridge between worlds—the past and the present. When I return home after my imagined visit with my father in “Visiting the Dead,” I put my husband in the poem for a specific reason. My father died when I was sixteen, and I met my husband when I was twenty-one, so they were never in my life at the same time. I could focus on the tragedy of that—my dad was in the Peace Corps, and my husband in AmeriCorps, and they would have gotten along famously—but instead it just feels like one of life’s trade-offs to me. I miss my father, but it helps to remember how lucky I am to have found the kind of love he would’ve wanted for me. Bsided: You have written a poem in response to the art on your chapbook cover, “Another Portal” by Maura Cunningham—what was it about her painting that spoke to you? Is that poem in this collection? MFJ: Oops, I guess I’ve already answered part of that—yes, that poem is in the collection! As for what spoke to me—I remember staring at it for a long while before I wrote anything. I knew the title was “Another Portal,” and I knew that “crooked door cut into the sky” in the painting had to lead somewhere. I’m not a religious person, so I don’t necessarily believe in heaven in the traditional sense. But this painting gave me the freedom to imagine what I’d like to do with my father if given the chance. I don’t know much about art, so I wonder if Maura would find this part hilarious, but I explain the beautiful blue light in the doorway of her painting as coming from an old television. I realized all I would want to do with my father is watch Wheel of Fortune together like we used to. Bsided: What additional poems in your chapbook would be effective as broadsides and why? MFJ: Ha, I already know that “Backyard” would make for a beautiful broadside, because it already is one! It was selected as the Switcheroo winner last year for Amy Meissner’s gorgeous textile work, “The Fragile Domestic.” I should mention here and now how grateful I am to Broadsided Press for gifting me the ideas for these poems, by the way! Other than that, “The Littlest Chicken” might be the most obvious answer, because—and again, I’m no artist—it seems all someone would need to do is paint a chicken in grass with a comb resembling a flame. (Pretty self-explanatory, that poem.) But I’d be more interested in seeing what an artist could make of “Visiting My Sixteen-Year-Old Self,” another portal poem of sorts. Bsided: A poem of yours, “Neighbors,” was broadsided this year by artist David Kamm. This poem was published for the special feature in Broadsided Press, “Bearing Arms: Responding to Guns in American Culture.” We’ve seen enormous student protest in the wake of gun violence in the United States, especially after last month’s tragedy in Parkland, Florida. Do you believe poetry has a role in protest? If so, how do you think we can best use poetry in resistance movements like #neveragain? MFJ: I absolutely believe poetry has a role in protest. We each have to find our way in to a subject so we’re coming from an authentic place and not being emotionally manipulative or preachy. I’m a high school English teacher, and I’ve been trying to find a way to write about the walkout we had last week. For now, I’ve been too overwhelmed to pick just one. I’m incredibly proud of the students who convinced our administrators why the walkout was the right thing to do. I’m happy and relieved to work in a place where our administrators believed in the students’ right to assemble peacefully. At the event itself, I was moved by a student who spoke about losing her brother to gun violence. It was all incredibly beautiful and inspiring, and I hope to find a way to put that experience into a poem at some point. More importantly, I hope some of the students who walked out that day find a way to write about it as well. Raquel Vasquez Gilliland is a Mexican-American poet, painter and aspiring micro-farmer. Her work has been published or is forthcoming in Dark Mountain and Fairy Tale Review.She’s most inspired by plants and stones and her family. Her first collection, Dirt and Honey, will be released in March by Green Writers Press.